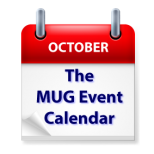 Lots happening on this week’s MUG Event Calendar. Two different California groups will be celebrating thirty years in operation, and groups in Florida and Pennsylvania will be looking at iOS 8. Filmmakers will make appearances at two creative pro groups and, of course, the new iPads will begin arriving this week, a topic that is certain to be at the top of the unscheduled list. Keystone MacCentral – iOS 8 information, Reflektor, 1Password, Photos, and Amazon Prime! Los Angeles Creative Pro Users Group – The iZotope RX4 audio repair tool is nothing short of magical. You must see it. Audio Guru Brian San Marco will present. Ryan Hunter and Josh Mellicker will show a series of color stylizing techniques using the newly released “FilmStyles” filters for Final Cut Pro X. We welcome editor Misha Tennenbaum. “Mastering a Craft – How does a person know when he or she has become a master at something?” Can a person be a “master” of a subjective art form? Let the discussion begin. And filmmaker Steve Payne returns with a Show and Tell featuring a day in the life at Burning Man.